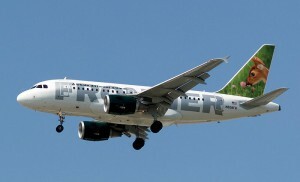 The low-fare carrier Frontier Airlines has announced it will start daily non-stop service from Orlando, Florida to Detroit on November 18. The airport and airline officials formally announced the news last Tuesday. The daily flight will leave Detroit Metropolitan Airport (DTW) at 12:30 p.m. and land at Orlando International Airport at 2:55 p.m.The return flight will depart from Orlando International Airport at 9 a.m. and arrive at DTW at 11:30 a.m. Flights in both directions will be serviced by an Airbus 320 aircraft which seats 180, officials said. At the announcement of the new daily low-fare service, Frontier Airlines offered special one-way tickets to Orlando for $39 on select dates for only 24 hours. In addition, a free round-trip flight to Orlando was given to a winner selected every hour among those who went online and registered. Daniel Shurz, chief commercial officer at Frontier said that the company is excited to offer even more low-fare service for Detroit with this new flight. The Orlando route will be the low-fare carrier’s fourth from Detroit. The company also offers nonstop flights to Denver, Washington Dulles and Trenton, New Jersey. Thomas Naughton, CEO of the Wayne County Airport Authority noted that Orlando is currently their customers’ second-most preferred destination from Detroit and for that reason, giving customers more of what they want became a high priority for airport officials. According to Naughton, customers love to have choices when planning a trip.